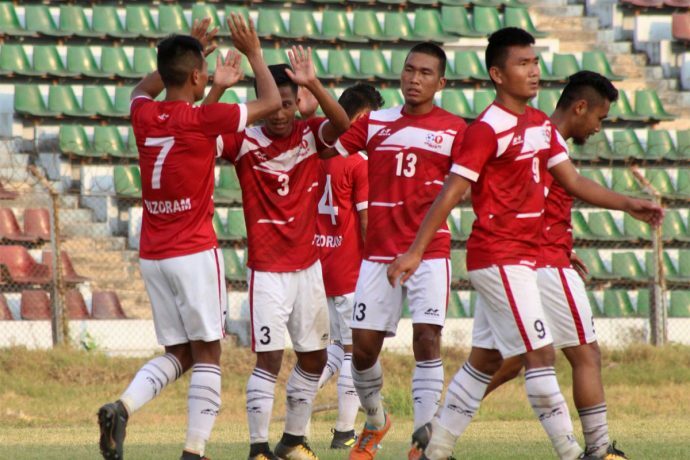 Mizoram completed a come-from-behind 3-1 victory over six-time champions Goa in their opening Group B game of the 72nd Santosh Trophy at the Rabindra Sarobar Stadium in Kolkata on Tuesday (March 20, 2018). Goa captain Victorino Fernandes opened the scoring in the 11th minute but F. Lalrinpuia equalised in the 25th minute. Thereafter two quick goals from Lal Romawia in the 81st and 84th minute helped the 2013/14 champions clinch victory and all three points. It did not take much time for the Western state to stamp their authority on the game. Marcus Mascarenhas ran from the left side to beat his marker and play a forward pass to India international Victorino Fernandes who made his way into the box to beat the Mizoram defenders and slot the ball past goalkeeper Laltanpuia Ralte to break the deadlock. The ‘home’ side for the game, Mizoram had their first notable moment in the 23rd minute. Lalbiakhlua’s cross from the right was missed by Lalremruata in the box but F.Lalrinpuia’s first-time shot was blocked well by defender Peter Carvalho. Their efforts were rewarded a couple of minutes later when Lalrinpuia equalised. Lalbiakhlua’s shot was stopped by the ‘keeper Ozen Vivian Silva and the loose ball fell to Lalrinpuia, fondly known as Valpuia. The striker’s first shot was blocked by a defender but he was successful in the second attempt to make the score line even again. Lalrinpuia, for all his heroics went straight into the referee’s book in the 34th minute. A rough challenge on Mackroy Peixoto and referee Mithun Kumar Kundu did not hesitate to produce the first yellow card of the game. Victorino tried another shot from long range but went over the bar and Lalremrauta missed twice from the box with only the ‘keeper to beat in the other end as the first half ended 1-1. After the break, Mizoram showed much more enthusiasm in the final third. In the 49th minute, Lalbiakhlua’s lob over the defence could have been converted by Lalremruata but his header from around 16 yards hit the crossbar and came off. The Goans could not keep the ball with them much and the Northeastern side showed good promise to get another one. However, they showed-off some set-piece moves on the field where Peter Carvalho took a free-kick on the dummy and Peixoto ran towards the left but his cross did not catch Laltanpuia Ralte off-guard as the ‘keeper parried off the effort. In the 81st minute, La Romawia played a diagonal ball towards Lalbiakhlua and the cross from the right was headed down brilliantly by Lalremruata inside the box. The striker laid it off for Romawia who netted the ball past the ‘keeper’s left side. Mizoram went on top of the group with with three points and lead Punjab on a better goal difference. They play Odisha next on Thursday and Goa would hope for a better show when they face Karnataka on the same day.